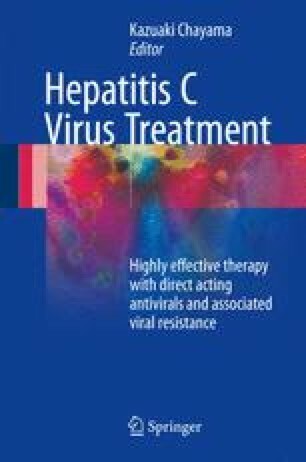 Telaprevir, a first-generation protease inhibitor, was approved in 2011 for use in antiviral therapy for hepatitis C in combination with PEG-IFN and ribavirin, and treatment of hepatitis C entered a new stage. In the Japanese phase III trial, triple therapy with telaprevir/PEG-IFN/ribavirin showed a much higher sustained viral response (SVR) rate (73 %) than PEG-IFN and ribavirin combination alone (49.2 %) in treatment-naïve patients. Furthermore, in clinical practice more than 90 % of treatment-naïve patients achieved SVR by management of drug dosing. In most cases, telaprevir-resistant variants appeared at the time of the treatment failure. But most telaprevir-resistant strains were replaced by wild-type HCV in the natural course. Now, in the era of IFN-free therapy, the role of TVR has decreased, but TVR played a key pioneering role in the shift to direct-acting antiviral (DAA) therapy.